Tom’s breath fogged up his window then disappeared like a ghost. He tried again, but no luck – the frost clinging to the outside of the windowpane refused to melt. He wished his parents would just go to bed. He’d been kneeling here on his bed, leaning on the windowsill for what seemed like an eternity. Then – footsteps on the stairs. Action stations. It was Mum, here to tuck Tom into bed. He lay rigidly still, breathing heavily with his arms by his side. He felt his mother’s shadow falling over him as she leaned in to kiss him softly on the head. Then she grabbed him and tickled him. He let out a loud giggle. How on earth did she do that every time? Anyone else would’ve fallen for it and believed he was asleep, but not Mum with her amazing radar skills. They shared a laugh about it and she kissed him again and turned off the light. He listened intently as Mum closed the door and went back downstairs to the living room. ‘Must be wrapping my presents right now,’ he thought, his ears conjuring sounds of foil paper and sticky tape. Tom awoke with a jolt and shivered. His bedclothes had made a bid for freedom, leaving just his pajamas to protect him. He grabbed his alarm clock, the luminous face teasing him with the time. Four o’clock am. Oh, flipping brilliant, he’d nodded off and been asleep for hours. But there was still time. He’d better move fast and silent, like that amazing ninja he’d seen on the telly. He swung his legs over the side of the bed, and ever so carefully stood up. Without a sound, he crept over to the door and removed his dressing gown from the door handle. Tom loved his dressing gown – it was fleecy and so cosy, especially good for a nippy night like this. Careful now, this was where it could all go horribly wrong. One false move and he’d wake the whole household. He reached out for the door handle, his arm rehearsing the exact distance he could open the door before it creaked. Slowly, slowly, he pulled the door open, slipped sideways through the gap, grabbed the outside handle and closed the door behind him with the tiniest click. Heart beating, Tom stood on the dark landing for a few seconds, catching his breath. That was intense, his best ninja move ever. Satisfied he hadn’t woken his folks, he padded gently across the landing towards the stairs. The soft, soundless carpet beneath his feet, he allowed his mind to wander a little. He began thinking of the prize that awaited him at the end of his mission, remembering how wonderful his presents had looked under the tree last year. They’d gleamed in their shiny wrapping paper like treasure, begging him to squeeze them. He’d picked up the biggest first, giving it a gentle rock to hear and feel what was inside. It didn’t take a genius to realize it was the games console he’d wanted. The box had matched the dimensions of the one in the shop exactly – he should know, he’d examined the display case at the supermarket enough times while Mum spent an age at the deli counter. Tom felt a rush of panic. Had he dropped enough hints about the music player? Maybe she hadn’t noticed during her massive quest for breaded products and two-for-one deals on the way to the checkout. Maybe he hadn’t been clear enough about the colour of the headphones – oh no, what a disaster. His pace quickened as he reached the foot of the stairs. An animal hiss erupted in his ears as he stepped into the hallway. Tom searched the gloom for the source of the din, dropping to his knees to peer under the sideboard. Wild eyes suddenly glared at him from the shadows there, along with more violent hissing. It was Fudge, the family cat. Whispering as loud as he dared, Tom told Fudge to be quiet. The animal shrank back beneath the sideboard with a final exasperated meow. The cat had almost been his undoing, but failure was not an option. He had to go and squeeze and prod at all the parcels bearing his name. Downstairs was even chillier than his bedroom, cold seeping into the hallway through hidden nooks and crannies. Tom pulled his dressing gown tighter and snuck into the living room. It was pitch black inside, owing to Mum’s annoying habit of switching everything off and unplugging it every night, “to be on the safe side.” This often drove Dad to distraction; especially if he’d set the tellybox to record late night sports shows. An acrid metallic smell filled the room. What had they been wrapping in here? ‘Only one way to find out,’ thought Tom as he edged his way around the perimeter of the room, feeling along the cabinet, then the wall. Finally, he felt the Christmas tree as he brushed against it. Baubles clinked icily as he located the power cord and followed it, crawling across the floor to the power socket in the corner. He felt the cold metal pins in his hand and turning the plug right side up, inserted it into the wall. Something wet dripped on his hand just as he pressed the switch. Something heavy and slick slid across his head. Tom scrabbled backwards in shock. Looking up, he saw the fairy lights twinkling. But they were red, not clear, as they had been earlier today and all last week since they’d decorated the tree. He stared, mouth agape, as he realized the lights weren’t red after all. Rather, it was what hung around them that gave them their crimson glow. The Christmas tree was slicked with blood and covered in strands of flesh and hair. Mum’s hair, and his sister’s. He could pick out his Dad’s tattoo on a piece of bloodied skin that dangled above a bauble like a handkerchief. Drooping branches struggled beneath the weight of the innards scattered across them like red tinsel. Ruined organs steamed like butcher’s offal at the hot kiss of the lights. Eyeballs hung there like baubles. He could recognize some of the pieces – he’d seen them in the big pop-up anatomy book at school – a section of intestine here, a tangle of veins there. Tom scrambled to his feet. Nausea hit him and he vomited stomach bile onto the living room rug. Turning fearfully around, he saw his family lying lifeless on the sofa like grotesque dolls. Their bodies had been torn apart. Flesh ravaged and ribcages exposed like the hulls of broken ships. The room span, and Tom sank to his knees, a dry scream dying in his throat. Cold eyes, watching him from the dark black of the fireplace. Watching him touching his presents. 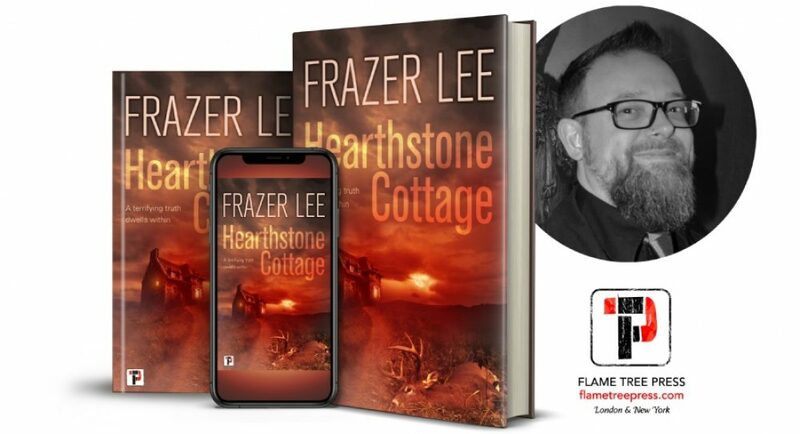 © copyright Frazer Lee, all rights reserved. a community storytelling project from members of The International Association of Media Tie-in Writers. for a free story every couple of weeks!